For those in the pedagogical set, the title, “Is the Classroom Lecture Becoming Extinct or Simply Evolving?” may have raised concern at the April 11 Common Hour, a community discussion conducted every Thursday classes are in session. However, they were soon assured. Through her approximately 45-minute lecture in Mayser Gym, Drennan used humor, slides, diagrams, illustrations and videos to demonstrate how she made chemistry relevant to her students. When she began teaching at MIT, a place where she expected to find many students inspired to become scientists, Drennan said, “I found out they also didn’t really appreciate the relationship between chemistry and the real world, and they didn’t see themselves as chemists. Drennan turned to education technology and used the clicker, a credit-card device (also an app) in which students clicked what they thought the correct answers are to questions she asked in class. With the clickers, she created teams and started weekly competitions on recitations. The winners would get snacks. The competitions would go on until the semester’s end when the winners in the final competition would get custom-made T-shirts. The competitions required students to study together, which helped build their confidence and social network. “It was a chance to form your team to study chemistry together,” Drennan said. 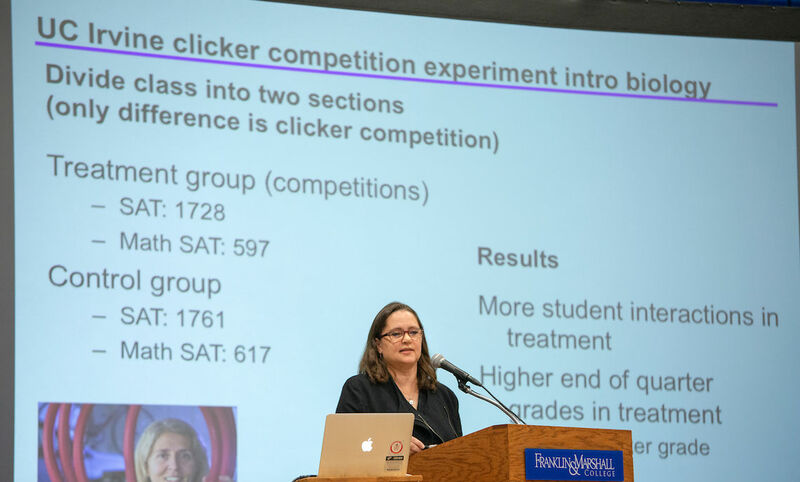 Drennan found through research that the clickers helped students with thinking, conceptualization and identifying weaknesses. She also showed students photos of young chemists and videos of graduate chemistry students such as Ben who talked about his struggles in college. They identified with the images and videos; they could see themselves as chemists. However, she said, some professors tried the clickers with their class, but didn’t like them.